On August 3, 2014, heavily armed militants of the “Islamic State” organization went on an unexpected offensive against Sinjar, in the north-west Iraq, against mainly Yazidi populated area. What followed has been qualified as “Genocide”: thousands of Yazidi men assassinated, women and girls kidnapped into sexual slavery, boys as young as 10 years old covered into Islam and trained as killers. Kurdish fighters aided by coalition air strikes have managed to take back much of the area in an offensive in November 2015. 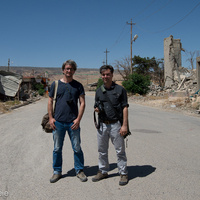 Two Professors from Webster University Geneva, Vicken Cheterian (Media-Communications and International Relations Departments) and Kristian Skeie (Media-Communications) have gone to document how Yazidis are surviving life after the ISIS Genocide. They will present their findings on Monday, September 5 at 6.30pm in the LLC Commons Room. The event is co-sponsored by Webster University Geneva Media-Communications and International Relations Departments, and supported by Webster Humanitarian Association (WHA).